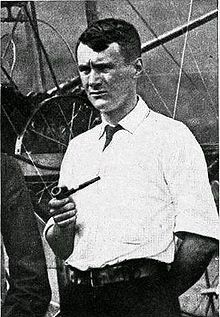 Thomas Etholen Selfridge (February 8, 1882 – September 17, 1908) was a first lieutenant in the U.S. Army and the first person to die in an airplane crash. He was also the first Active Duty member of the U.S. military to die in a crash while on duty. He was killed while seated as a passenger in the Wright Flyer, on a demonstration flight piloted by Orville Wright. Selfridge was born on February 8, 1882, in San Francisco, California. He was the grandson of Rear Admiral Thomas Oliver Selfridge Sr. He graduated from the United States Military Academy in 1903 and received his commission in the Artillery Corps. He was 31st in a class of 96; Douglas MacArthur was first. In 1907, when the Artillery Corps was separated into the Field Artillery and Coast Artillery Corps, Selfridge was assigned to the 5th Field Artillery Regiment and the following year to the 1st Field Artillery Regiment. Selfridge was stationed at the Presidio during the great San Francisco earthquake of April 18, 1906. His unit participated in search and rescue as well as cleanup operations. In 1907, he was assigned to the Aeronautical Division, U.S. Signal Corps at Fort Myer, Virginia, where he was later instructed in flying a dirigible. He was also the United States government representative to the Aerial Experiment Association, which was chaired by Alexander Graham Bell, and he became its first secretary. Selfridge took his first flight on December 6, 1907, on Bell's tetrahedral kite, the Cygnet, made of 3,393 winged cells. It took him 168 feet in the air above Bras d'Or Lake in Nova Scotia, Canada, and flew for seven minutes. This was the first recorded passenger flight of any heavier-than-air craft in Canada. He also flew a craft built by a Canadian engineer, Frederick W. Baldwin, which flew three feet off the ground for a distance of about 100 feet. Selfridge designed Red Wing, the Aerial Experiment Association's first powered aircraft. On March 12, 1908, the Red Wing, piloted by Frederick W. Baldwin, raced over the frozen surface of Keuka Lake near Hammondsport, New York, on runners and managed to fly 318 feet, 11 inches, before crashing. Red Wing was destroyed in a crash on its second flight on March 17, 1908, and only the engine could be salvaged. On May 19, 1908, Selfridge became the first US military officer to pilot a modern aircraft when he flew solo in AEA's newest craft, White Wing, traveling 100 feet on his first attempt and 200 feet on his second. Between May 19 and August 3, he made several flights at Hammondsport, culminating in a flight of one minute and thirty seconds at a height of 75 feet. The next day his final solo flight of fifty seconds covered a distance of 800 yards. Although not fully trained as a pilot, Selfridge was nevertheless the first U.S. military officer to fly any airplane unaccompanied. In August 1908, Selfridge was one of three pilots trained to fly the Army Dirigible Number One, purchased by the US Army from Thomas Scott Baldwin in July 1908; his training partners were Lieutenants Frank P. Lahm and Benjamin Foulois. The dirigible was scheduled to fly from Fort Omaha, Nebraska, to exhibitions at the Missouri State Fair in Sedalia, Missouri, piloted by Foulois and Selfridge. However, the Army had tentatively agreed to purchase an airplane from the Wright Brothers and had scheduled the acceptance trials in September. Selfridge, with an interest in both heavier-than-air and lighter-than-air ships, obtained an appointment and traveled to Fort Myer, Virginia. In September 1908, Orville Wright visited Fort Myer to demonstrate the 1908 Wright Military Flyer for the US Army Signal Corps division. On September 17, Selfridge arranged to be his passenger and Wright piloted the craft. On this occasion, the Flyer was carrying more weight than it had ever done before; the combined weight of the two men was approximately 320 lbs. The Flyer circled Fort Myer 4½ times at a height of 150 feet. Halfway through the fifth circuit, at 5:14 in the afternoon, the right-hand propeller broke, losing thrust. This set up a vibration, causing the split propeller to hit a guy wire bracing the rear vertical rudder. The wire tore out of its fastening and shattered the propeller; the rudder swiveled to the horizontal and sent the Flyer into a nose-dive. Wright shut off the engine and managed to glide to about 75 feet, but the craft hit the ground nose first. Both men were thrown forward against the remaining wires and Selfridge struck one of the wooden uprights of the framework, fracturing the base of his skull. He underwent neurosurgery but died three hours later without regaining consciousness. Wright suffered severe injuries, including a broken left thigh, several broken ribs, and a damaged hip, and was hospitalized for seven weeks. On the fourth round, everything seemingly working much better and smoother than any former flight, I started on a larger circuit with less abrupt turns. It was on the very first slow turn that the trouble began. ... A hurried glance behind revealed nothing wrong, but I decided to shut off the power and descend as soon as the machine could be faced in a direction where a landing could be made. This decision was hardly reached, in fact, I suppose it was not over two or three seconds from the time the first taps were heard, until two big thumps, which gave the machine a terrible shaking, showed that something had broken. ... The machine suddenly turned to the right and I immediately shut off the power. Quick as a flash, the machine turned down in front and started straight for the ground. Our course for 50 feet was within a very few degrees of the perpendicular. Lt. Selfridge up to this time had not uttered a word, though he took a hasty glance behind when the propeller broke and turned once or twice to look into my face, evidently to see what I thought of the situation. But when the machine turned head first for the ground, he exclaimed 'Oh! Oh!' in an almost inaudible voice. Two photographs taken of the Flyer just prior to the flight, show that Selfridge was not wearing any headgear, while Wright was only wearing a cap. Selfridge would most likely have survived the crash if he had been wearing a helmet of some kind. Following the crash, and as a direct result of Selfridge's death, first pilots of the US Army were instructed to wear large heavy headgear reminiscent of early football helmets. Thomas Selfridge was buried in Arlington National Cemetery in Section 3 Gravesite 2158, adjacent to Fort Myer. Selfridge Air National Guard Base is named after him. The base is located in Harrison Township, Michigan, near Mt. Clemens, 22 miles NNE of Downtown Detroit, Michigan (from the US Port of Entry at the Detroit-Windsor Tunnel). Though buried in Arlington National Cemetery, Selfridge is memorialized by a large cenotaph in Section XXXIV of West Point Cemetery. The damaged propeller of the Wright Flyer wrecked at Fort Myer can be viewed at the National Museum of the United States Air Force, at Wright-Patterson Air Force Base, in Dayton, Ohio. A gate between Arlington National Cemetery and Fort Myer, located approximately halfway between the two chapels on Fort Myer, is named "Selfridge Gate", in his honor. ^ "Prominent Military Figures". Arlington National Cemetery. Retrieved 28 August 2018. ^ a b "FATAL FALL OF WRIGHT AIRSHIP; Lieut. Selfridge Killed and Orville Wright Hurt by Breaking of Propeller. MACHINE A TOTAL WRECK Increased Length of New Blade and Added Weight of a Passenger Probable Causes. CAVALRY RIDE DOWN CROWD Rumor That the Machine Had Been Tampered with Denied by Army Officers -- Not Well Guarded" (PDF). The New York Times. September 18, 1908. Retrieved October 17, 2010. Falling from a height of 75 feet, Orville Wright and Lieut. Thomas E. Selfridge of the Signal Corps were buried in the wreckage of Wright's aeroplane shortly after 5 o'clock this afternoon. The young army officer died at 8:10 o'clock to-night. Wright is badly hurt, although he probably will recover. ^ "Lt. Thomas E. Selfridge". Mount Clemens Public Library. Archived from the original on March 14, 2007. Thomas E. Selfridge was born in San Francisco on February 2, 1882. Little is known about his early life. He was graduated from the United States Military Academy at West Point with the Class of 1903. Selfridge ranked 31st in the class of 96 cadets that year; future general Douglas MacArthur was first. ^ a b "The First Fatal Plane Crash… At Fort Myer, Virginia, September 17th, 1908". Check-Six.com. November 22, 2014. ^ "Thomas Etholen Selfridge". www.af.mil. Archived from the original on July 17, 2012. Retrieved December 13, 2014. ^ "Air Corps News Letter" (PDF). XXI (1). Office of the Chief of the Air Corps, War Dept., Washington. January 1, 1938. Archived from the original (PDF) on September 3, 2015. ^ Kingseed, Wyatt (August 19, 2001). "The First Airplane Fatality: February '01 American History Feature". www.historynet.com. Retrieved May 24, 2018. The spectators stood momentarily stunned. Then they surged across the field to the plane. The post commander sensed that the situation could get out of hand and ordered a cavalry guard forward to stem the tide. "If they don't stand back," he yelled, "ride them down!" ^ Miss Celliana (March 13, 2013). "Orville Wright and the First Person to Die in an Airplane". www.neatorama.com. Retrieved May 24, 2018. ^ "Miracle at Kitty Hawk: Unpublished Letters of the Wright Brothers (Part I)". The Atlantic. May 1950. Retrieved May 24, 2018. ^ "Wilbur Wright Weeps. Aviator's Brother Grieved by Fatal Accident. Deplores Officer's Death. First Thought Is Safety of Passengers, He Says, When News of Orville's Mishap at Fort Myer Reaches Him in France. Countermands Orders for Flights, to Regret of Waiting Crowd". Washington Post. September 19, 1908. Retrieved June 5, 2018. Le Mans, France, September 18, 1908. Wilbur Wright, brother of Orville Wright, and who has been conducting a series of experiments here for several weeks with a Wright aeroplane, was very much perturbed when he heard this morning the news from Washington that his brother had suffered an accident, in which Lieutenant Thomas Selfridge lost his life. ^ "Thomas E. Selfridge and Orville Wright (1 picture)". Getty Images. September 17, 1908. Retrieved October 2, 2017. Wikimedia Commons has media related to Thomas Selfridge. "Photographs of first powered aircraft fatal crash". Retrieved August 6, 2009. "Selfridge Field and the beginnings of air power". Archived from the original on February 24, 2006. Retrieved May 19, 2005. "Frederick W. (Casey) Baldwin". Retrieved May 19, 2005. "A Most Noble Experiment". Retrieved May 19, 2005. "Aviation in Canada 1938". Retrieved May 19, 2005. "History of Selfridge". Archived from the original on February 6, 2005. Retrieved May 19, 2005. Ramirez, Charles E. "Remembering Lt. Thomas E. Selfridge". Detroit News. Detroit News. Retrieved 2008-09-16.